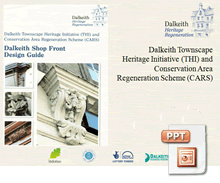 The Centre of Dalkeith has been designated as a Conservation area, the historic and architectural character of which is important to conserve and enhance. 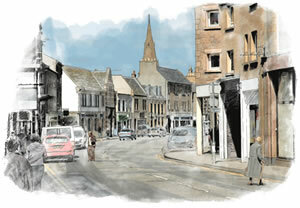 Dalkeith has a fascinating history with a surviving medieval street layout and many historic buildings dating from the 17th, 18th and 19th centuries. Many of these are listed because of their historic and architectural value. At its peak, Dalkeith was the most important grain market town in Scotland, its architectural position was reinforced by a wide variety of local manufacturing plants and workshops. The shops provided a comprehensive retail service to a significant surrounding population. Dalkeith, too, made a considerable contribution to the political social and military history of the nation. 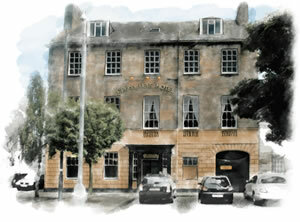 There are a number of key historic buildings that have unique stories to tell, Dalkeith Mansion, the Corn Exchange, the Tolbooth, the Cross Keys, the Church of St Nicholas Buccleuch, the Tait street corners, amongst others. The High Street itself with it’s 4 storey tenement buildings in stone and slate curving and widening out adjacent to the Corn Exchange and the Tolbooth represents an interesting piece of townscape. The setting of the town, on a ridge between the north and south Esk with Dalkeith Country Park to the North East, Ironmills Park to the South and Newbattle Abbey to the South east is extremely attractive and imposing. To help protect and enhance the setting and character of the town a Conservation Area Appraisal has been produced. This describes the Historic architectural importance of the town. The Key features and buildings within the conservation area are described as are the landscape character and setting of the town. The appraisal also highlights some of the issues and problems, this includes the condition of some of the buildings and improvements that could be made. A Management Plan has also been produced and this follows on from the appraisal and identifies how the area should be managed and improved to increase the economic competiveness of the town centre. The town trail guide will be updated as a result of the work currently being carried out by the Heritage Trail Group.
. Dalkeith Heritage Trail Leaflet.